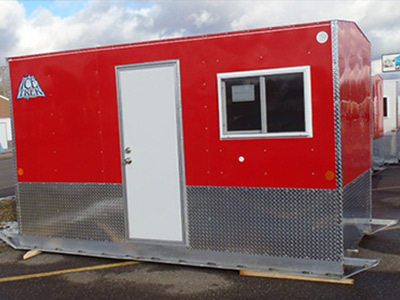 Ice Trek Skid Ice Fish Houses are designed and manufactured in Minnesota's north country where they know what it takes to build tough and durable equipment to withstand the worst of Mother Nature's winters. The Ice Trek all-aluminum alloy frame is hand-welded at every seam, and with all-aluminum alloy there's no rusting and no frame deterioration due to road salt. Ice Trek skids are delivered open shell, saving you money and allowing you to custom finish your ice house as you see fit. All aluminum hard-sided construction - light and rust-free. Extremely lightweight construction - easy to pull with snowmobile or ATV. Open interior - customize yourself and save. 3/4" treated plywood flooring (compare the competition at 5/8"). 26" insulated service door - available in front or side entry. Dark house ready - spear hole can be cut into one end. Comes with vinyl slider window(s) - 32"x 22"